We don't know for sure Dilkouch was an Afghan Hound. However we note that the owner Mrs Whitbread owned two true Afghan Hound (Persian Greyhound/Afghan Greyhound) type hounds several years earlier. These two predecessors were Shahzadah and Moroo, both featured earlier in this timeline section, including photographs (they are preserved and available to view at The British Museum). 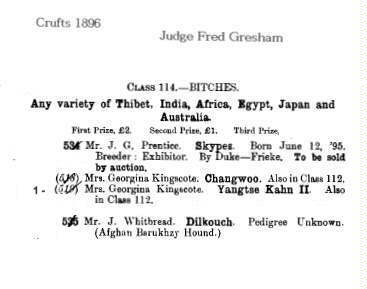 So given Mrs Whitbread's history with the early breed, seems likely that Dilkouch was of a similar Afghan Hound type.